It's official. Landmark launches on June 10. It's probably not ready but when did that ever stop an MMO? Launch has arrived at an opportune time for me. I finally have a PC that can run the thing without stuttering, lagging or feeling as though the controls have been coated in treacle. I logged in this morning and went through the usual ritual. My claim had lapsed and someone else had grabbed it so I went looking for a new one. There was very little free space on my island, which suggests there must be people around, even if it's rare to see anyone. I found a nice hill overlooking a lake, retrieved my Claim flags from overflow, opened my Design tab, located the starter tower and plonked it down. I really like that tower. I never feel quite settled until I've stood on my battlements and had a good look around. With that out of the way I went for a wander to see what the neighbors were up to. 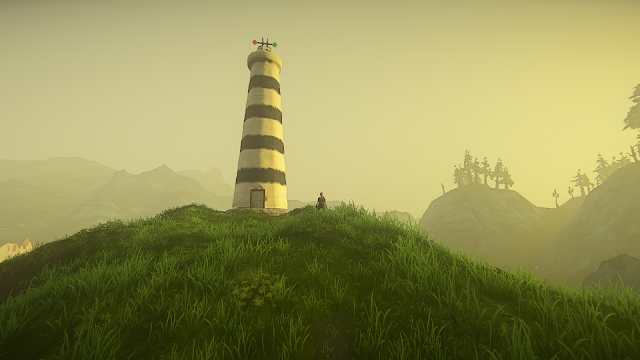 Screenshots of Landmark look better than the game itself and always have done. It's hard to be sure, even looking back at pictures I've taken over years of development, but I can't help feeling that, although the game now runs far more smoothly and comfortably than ever before, it looks worse. I spent a good while fiddling around with the settings but I could scarcely tell the difference between Medium, High and Ultra. It might be my imagination or a trick of memory but I'm sure I remember it looking better than this. Not that it looks bad. It looks fine, although all objects seen at a distance still suffer very badly from the Plasticine effect. On a couple of Build Sites I found that even up close some of the things people had built looked as though they'd melted a little. Elsewhere they seemed sharp and well-defined. Whether that has something to do with the materials or the techniques the different builders employed I couldn't say but it's odd. The original Calderock Village as seen in Dragon Nest. Neither could I say with any confidence whether Landmark is ready for a full launch or, if it is, whether there's an audience that cares. It's certainly less buggy and more finished than it was but that's not saying all that much. On the other hand, it's nowhere near as unfinished or unready as many other MMOs I've played at release. There's definitely enough there, at last, to comprise a form of entertainment. What that form might take, though, isn't much better defined than it's ever been. The tools are firmly in place to build structures, terraform terrain and decorate and design interiors and exteriors. There's a fair range of options for telling stories and creating adventures. You can place NPCs, make them talk, move, react. Players can pull switches here to open gates there. You can place creatures and make them fight. Calderock Village - Landmark style. Combat works. It's not subtle and it's not complex but it's not bad. From my perspective it doesn't feel a lot different to combat in Black Desert. Although I'm well aware that BDO combat has the potential to be quite sophisticated and skillful, in practice all I've done there for twenty-five levels is hold down the left mouse button and occasionally press the right for variety. Landmark works the same way. Moving around in Landmark is hugely easier than it was. You can port to the Spires to change Islands or home to your Claim at will with no cooldown. Most importantly, players can now find what Builders have built very easily and quickly. There's a facile interface called the Gallery that's easy to follow, with a good range of sorts and a straightforward and immediate option that takes you to the location in a click. It's attractive and pleasant to browse, resembling a shop window, which in a way it is. I visited a couple of mildly disappointing, unfinished builds before I noticed a familiar image. I'm used to finding recreations of familiar places from Everquest or WoW or Lord of the Rings but this is the first time I've ever seen anyone reconstruct an iconic location from Dragon Nest. It's a while since I played DN but I recognized Calderock Village immediately. I ported there and strolled around. Well, I strolled after I'd killed a few aggressive skeletons that I don't recall ever seeing in the original. It's not a brick for brick reconstruction but it's an excellent cover version, entirely recognizable. What's more, it's a very impressive demonstration of the power of the toolset in the hands of a skilled designer. 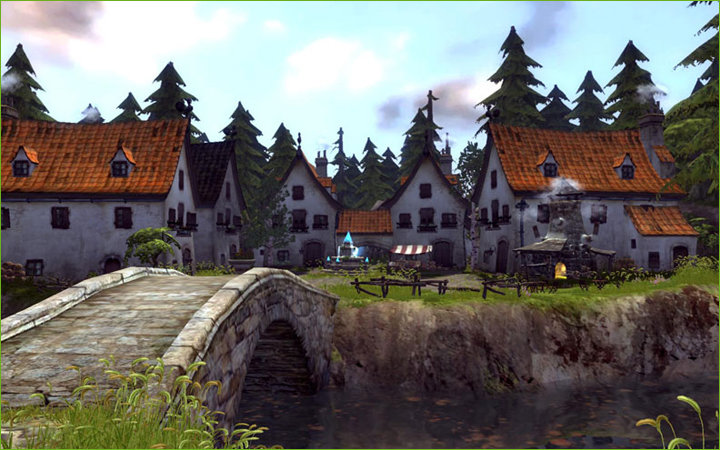 This version of Calderock would make a very welcome village and quest hub in any MMO. Indeed, it represents a huge improvement on the actual Calderock in that you can go indoors. The buildings are beautifully decorated and finished. I was impressed. I like a high ceiling, me. Other than the wandering undead, though, there didn't seem to be much in the way of adventure. 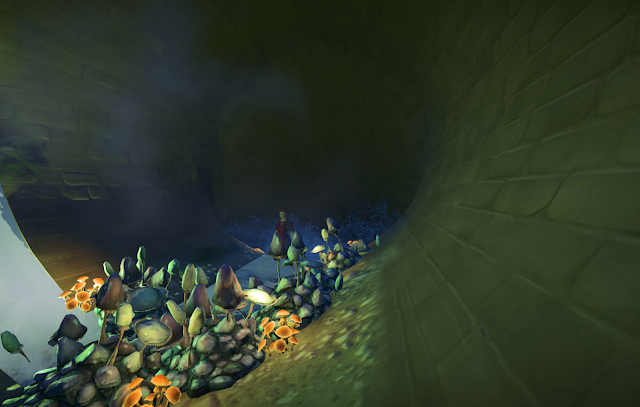 I was curious to see how well Landmark can tell stories so I went back to the Gallery, where I found an example of that old classic entree to adventure, a storm drain. Reading the full description, helpfully provided by the creator, I was intrigued to learn that this particular storm drain served the ancient elven city of Takish'Hiz. You can take the EverQuest out of Landmark but you can't take it out of the players or so it seems. I ported over and was greeted immediately by a demi-human of indeterminate species, possibly a Kobold, who told me I was late and ordered me to get down the drain, pronto. From there everything proceeded just like an adventure or a quest in any other MMO. NPCs chatted to each other, walked about, made observations and generally acted like scene-setters should. I progressed through well-designed tunnels and cleared rooms of monsters, retreating as necessary to heal up at the campfire I'd dug out of my backpack and lit in the middle of the passage. Convenient for The Spires. Good school district. There were trapdoors to open and wells to jump down. There were mini-bosses and Elites. I was thoroughly enjoying myself until eventually a bad pull got me two tough Overseers at once and I found myself faced with the choice of spending Lumens, the in-game currency, to jump straight back up or taking the free ride back to spawn. Opting for the latter was probably a mistake because as I made my way back down I discovered the whole adventure had reset to its starting state. I'm guessing that's an option under the control of the designer. I hope so, anyway, because my days of redoing entire dungeons until I get them right are long over. So that was where I stopped. As usual, logging in to Landmark for a few minutes turned into a session of a couple of hours. 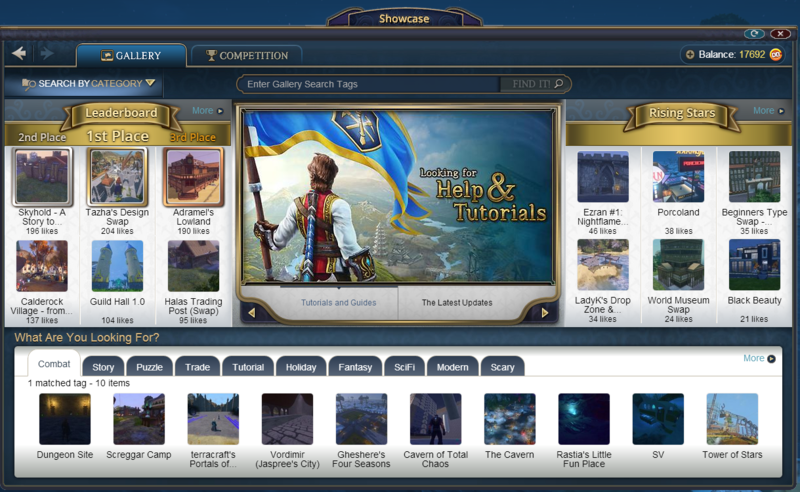 I'm by no means convinced that the game is ready for a full and final launch but, as I began this post by observing, when is any MMO ever "ready"? It is, in my estimation, ready enough. Or, if you prefer, as ready as it will ever be. I can't see any particular reason to keep it in "Early Access" or "Beta" or whatever protective cover it's been under until now. That's not to say it couldn't be better. If DBG don't just push it out the door and leave it to fend for itself, as some commentators have suggested they plan to do, then in time it almost certainly will be better. As of June 10, however, for better or worse it will be done. There will be no more wipes. Builders can build and build on what they build without fear of having to start over and over again. The world will fill out. Maybe it will even find its shape at last. For ten dollars you could do a lot worse. I'm curious about Landmark, but I get the impression it probably isn't enough of a game to hold my attention for very long. Not sure I want to pay cash for a game I don't intend to play long-term, even if it is quite cheap. It's not a bad product as it stands right now. I'd hesitate to call it a "game". It's mostly a toolset that you could use to make scenarios for a game or just to make things for your own amusement. My estimate is that it will attract a small but dedicated following who will stick with it and not bother anyone until the inevitable day when the servers are closed due to it not making anyone any money, at which point DBG will acquire yet another cadre of venomous detractors hell-bent on badmouthing anything they do for all eternity. Lord knows they must be used to that by now. Who Says Looks Aren't Everything? Dream of Last Night: ...??? What I’ve been doing recently. 2 Frying Pans and a Horse. A Robot to Clean My House. Hey I won Bronze in Blaugust! The End of Blogging ? “The PvP Summer”….? No Thanks. Just in time for E3! Hang on tight for the ride! Hey Anubis, know any single player games? Level 6 – Much Ado About Nothing!